There’s no other apps on the market that tightly integrates recipes, meal plans with your shopping list like Grosh does. Just swipe recipes straight onto your meal plan – that’s it! You could use a dedicated recipe app that allows you to get inspiration and place bookmarks. How about the recipes you’ve made up or collected over time from various sources? Maybe you use a note taking app for a lot of things, including recipes? However, it’s unlikely to have a meal plan and reminders what you’ve not tried out for a while. Grosh provides you with a safe place for all your recipes – and an easy way to add recipe ingredients to the shopping list and activate your recipes in the form a meal plan. Upon request of our users, we’re now introducing meal plans. Meal plans help you organise your shopping based on what you plan for the upcoming week. People using meal plans tend to do fewer grocery shopping trips and be more efficient shoppers. The recipes tab corresponds to the suggestions of your shopping list. Recipes is similar to before, with the exception that you may swipe recipes to the meal plan. Colour coding helps you see what’s already planned. The meal plan presents an overview of all meals planned for this (and next) week. Tap the meal to assign date or responsible person. Or just read the recipe when preparing the meal. Meals for past weeks are stored in the history. So, have a look on what you had previous weeks and just swipe to add a meal to the current week. Based on past meal plans stored in your history, Grosh is able to suggest recipes. Recipes are marked red when you’ve not tried them for a while. Who can use meal plans? Grosh Premium subscribers have full access to meal plans – other users can only view the meal plan. 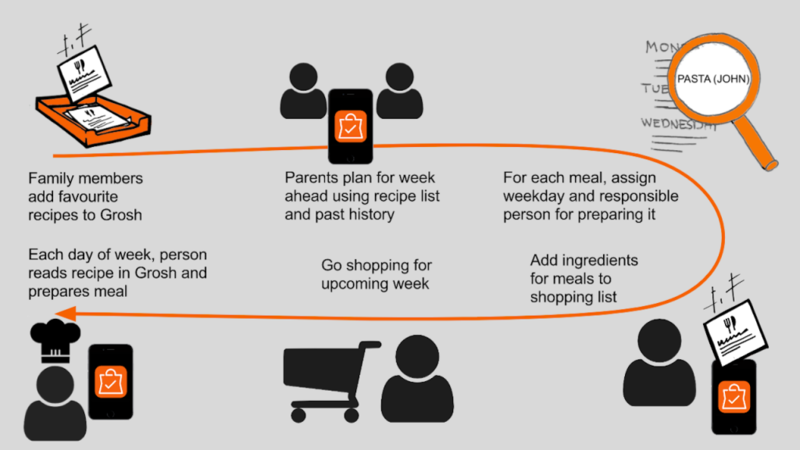 Users with access to a particular shopping list automatically have access to the associated meal plan. See the infographics above for illustration of the example.